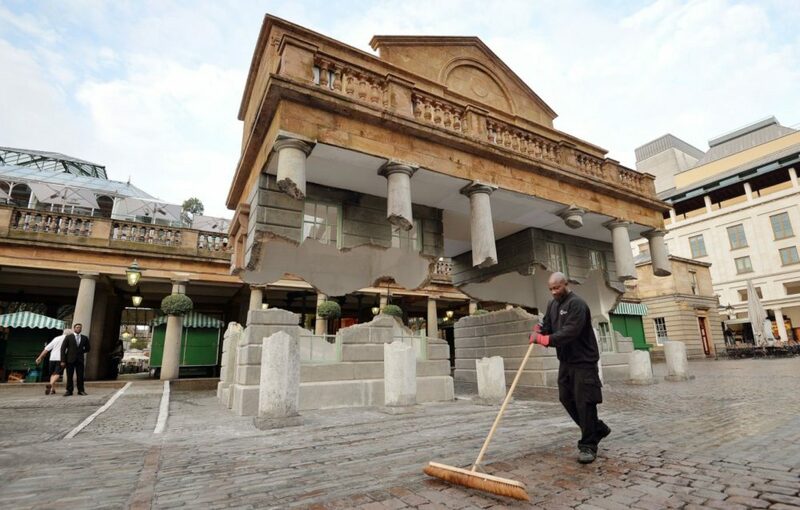 An art installation which recently took residence on the East Piazza at Covent Garden in London saw a section of the building ‘levitate’ – with one of the key structural elements of the illusion provided by Brett Martin Plastic Sheets. Modelled on the original architecture of the 184 year old market building, the artwork ‘Take my lightning but don’t steal my thunder’, has been designed by London artist Alex Chinneck and built by a 100-strong team who have conjured up the illusion that a 40-foot-long building has broken from its stone base and then floated 10 feet into the air. With this unusual project designed around both weight and aesthetics, the building had to be as light as possible but still look like a stone and brick building. Built from a steel and timber frame, the walls were created using Brett Martin’s Marlon ST Longlife, a structurally strong, lightweight multiwall polycarbonate sheet. Polystyrene was then intricately carved using robotic hot-wire cutters, and glued to the polycarbonate sheet prior to the application of the plaster and granite sand finish to match the existing market building. 10 mm Twinwall Marlon ST Longlife was chosen for the artwork. Ordinarily used in roofing and glazing applications, the multiwall structure of Marlon ST Longlife provides a high stiffness-to-weight ratio. The sheet is designed to be strong yet light in weight, a key consideration for this architectural illusion. Following a pre-fit at the fabrication shop to ensure it all went together like a jigsaw puzzle, the artwork was then shipped by 10 arctic trucks and installed over four days at the Piazza.